Well, Traci Bautista has done it again, produced a book packed with inspiration, ideas, and techniques. This time her focus is printmaking. In the broad sense. 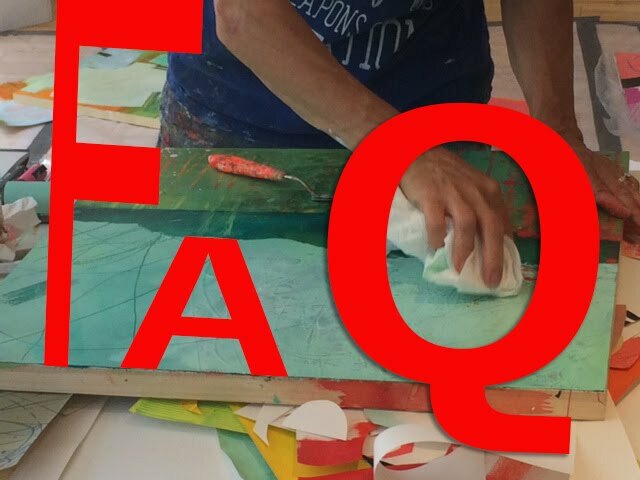 It includes techniques on making rubbing plates, stencils, stamps, and other tools for creative mark making, as well as inspiration for using them. Browse this book on Amazon. One technique that was quick-and-easy, but totally caught my eye, was a method for stamping lines using rolled up cardboard. Here is a rolled up piece of corrugated card that I used as a stamp in the piece below. The black lines are made by stamping the corrugated card. The white marks in the upper right are made using a piece of mat board. This is just a strip of ordinary corrugated cardboard I used as a stamp in the following pieces. Here I used both the corrugated card and the regular cardboard, in the lower section of this piece. They make very different line qualities. And more, in the upper right, contrasting with the paint marker, crayon, and graphite marks. Here is the giveaway package! A pad of Strathmore Printmaking paper, 8"x10"
Just comment on this post with your thoughts on any of the above, and I will do a random drawing on Friday, August 15. YOU MUST CHECK THE BLOG ON FRIDAY and contact me if you are the winner, or provide a contact e-mail in your comment. Please make sure your name uniquely identifies you. Not just "Mary", but "Mary K in Indiana", or something like that. Take a look at this book even if you don't win the giveaway. It is lots of fun to dip into for new technique ideas. Traci uses EVERYTHING in service of mark making! Love your art Jane. I must try this corrugated cardboard technique! SO inspiring! Love reading and watching your videaos! Thank you Jane for sharing your techniques and your creativity! I only discovered your blog a few days ago and I'm loving all your creative ideas. I've become very restricted in my painting process and I think your creativity in so many ways is truly inspiring and for me freeing, loosening the boundaries I've put around myself. I'm 72 and needing to change so I would love to win your prize, a very generous offer. Aubrey fro Australia! Beautiful! Would love to try this out!! Your art is beautiful and your generosity is very appreciated. I am a new reader of your blog and I am in love with it. It is very inspiring and it has great ideas. The giveaway looks awesome! I would love to be able to play with all of those materials. Love the cardboard stamping techniques, so simple but with such cool results. Thanks for sharing! Thank you for the chance of winning this awesome giveaway! Thank you for the opportunity! I've got this book on my Amazon wish list. It looks amazing. I attended one of your classes in Phoenix and just loved it. I'm the one who messed up the days and I really appreciated your letting me attend the next day! By the way...where are my manners? Thank you for having the giveaway! Thank you for sharing Traci's new book and your own ever-colorful examples of printing lines with the end of corrugated cardboard. 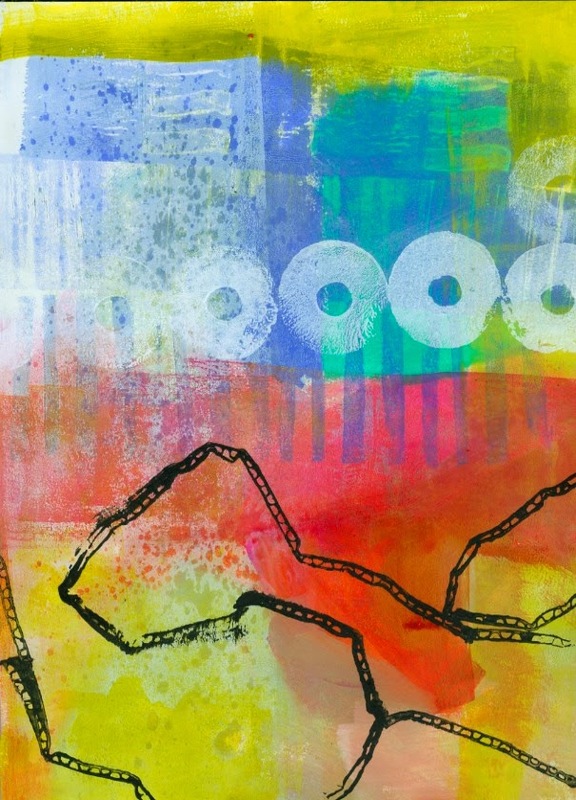 I am just exploring monoprinting right now and looking for all kinds of household supplies to make designs on my Gelli plate. You and Traci are giving me some great ideas here! What a good giveaway! I like cardboard. mark making is especially difficult for me, but i really like the effect. i think that marks make the finished piece more personal. i am currently trying your "blind" marking technique with the pitt pens i got after the kansas city workshops. the cardboard idea is great because it uses something i always have on hand. next i might try a pastry cutter by rocking it across the paper. it looks amazing,would love to have! great work too! This is so wonderful. I really love the 4th photo - the colors are so bright and the black corrugated lines just amplify the colors. So gorgeous! I love what you are giving away! Of course I would love to be the lucky winner! Thanks for all the lovely art you share with us! Denise Baldwin of Odd imagination. Those scribbles are fantastic! 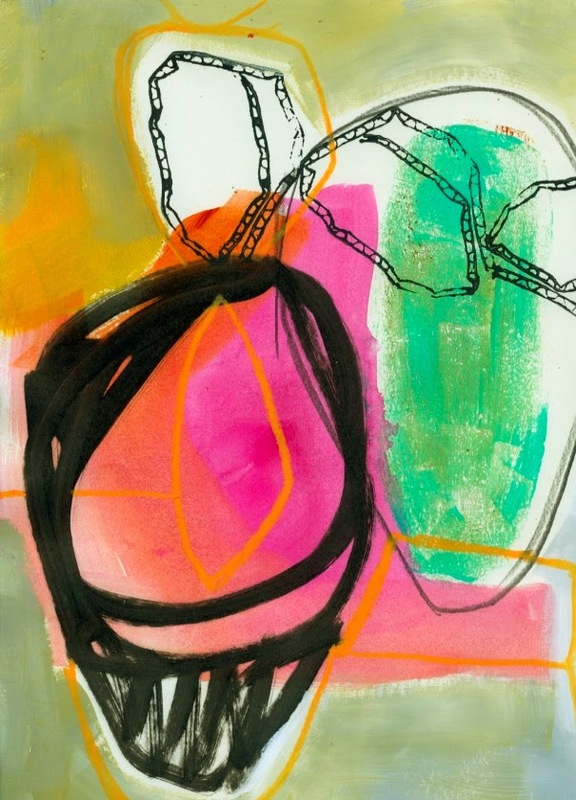 I have Traci's book on Doodles, this idea with the little ellipses is totally in the spirit of it! Thank you for the chance and sharing your ideas. I have your wonderful DVD and learned so much from it, as well as from your tutorials. Thanks, Jane. I love those corrugated cardboard marks! Thanks Jane for the opportunity to win your package giveaway ...I love both yours and Traci's work! Simple ideas with great effect. It looks like a very inspirational book. I would love to win it. Thanks for giving the opportunity. This is great! Looks like fun and lots of ideas to use. These simple techniques are stunning! 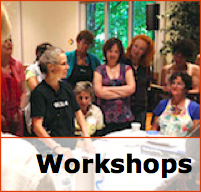 Would love to take a workshop with you someday. Traci's book is on my wishlist. Thanks for sharing your work! Jane N. In Vermont. Oh how fun, I'd love to read that book as stamping and mark making is something I love a lot! I just posted about stamping with Found Objects on my blog this week. Thanks for all the inspiration you post! Would love to win this giveaway. The thought of just using found things in my artwork has to be a bonus. Like not having to splash the cash. I've been using corrugated cardboard for stamping for years, but never thought to turn it on it's end...what an obvious (and awesome!) idea! Would love a chance to win this book. Thanks for the chance! I've used toilet paper tubes for printing, but the corrugated cardboard adds another wonky kind of line. I'm on the list to borrow this book from our library, but my turn hasn't come up yet, so I'd love to have my own copy. I recently got back into collage and would love to have some new inspiration. I like making postcards out of cardboard. I like the stamping idea :) Thanks for having the giveaway. I love the look of the cardboard stamping. Thanks for the giveaway! It's amazing how something as simple as a bit of cardboard can great such wonderful marks! thanks for the chance to win. I am so glad I found the link to you on Pinterest. I am amazed at how different all the pieces of art look, even while using all the same supplies. I love the fluidity of the first picture, and the boldness of the last! Thank you for sharing, you have given me another technique to try and helped me push my art bounderies a little more! I'll be back! I like the marks made with the cardboard, and heaven knows that's plentiful enough! Thanks for the chance to win the package of supplies and the book. I'm sure it's filled with more tips and tricks I'd like to know! That looks like a great book! And if it gave YOU some new ideas, well then, it is a keeper for sure! count me in! Your mark making on the art pieces look so fantastic. I've been reading blogs and IG postings about artists using this book. It looks like a good one! I have Tracey's other books so of course I'd LOVE to add this one too!! LOVE how you have used some of her techniques for your own wonderful art Jane. Thanks so much for the chance to win this generous giveaway! I love the way the corrugated cardboard turned out on your work! Now I want to play! Wow! Thanks for a chance to win this awesome book and supplies. I've been out of printmaking for awhile, but just looking at this book inspires! Thanks for sharing your technique--can't wait to try it! Love Traci's new book! I found it at the library and have been reading it a little at a time. Very nice stuff! Thank you for the very generous giveaway you are hosting! I love what you did with the cardboard! So excited about Traci's new book! I have been practicing my mark making - this would be a great addition to my exploration. I love using the corrugated cardboard for stamping! Your pieces look so playful and full of energy. To me, the cardboard resembles a chain link. 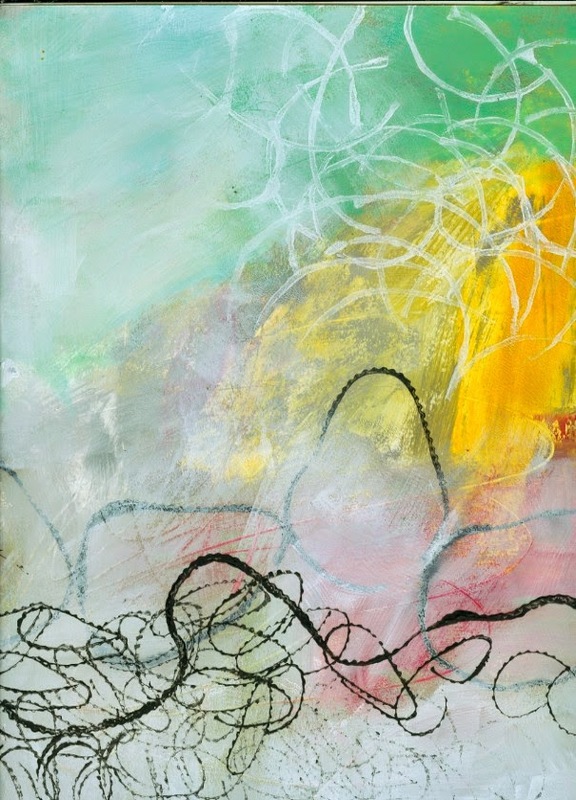 It almost acts as a metaphor in your paintings: by them being abstract, the "chain" brings a sense of harmony, energy, and variety to the composition, all while keeping everything in balance, together. 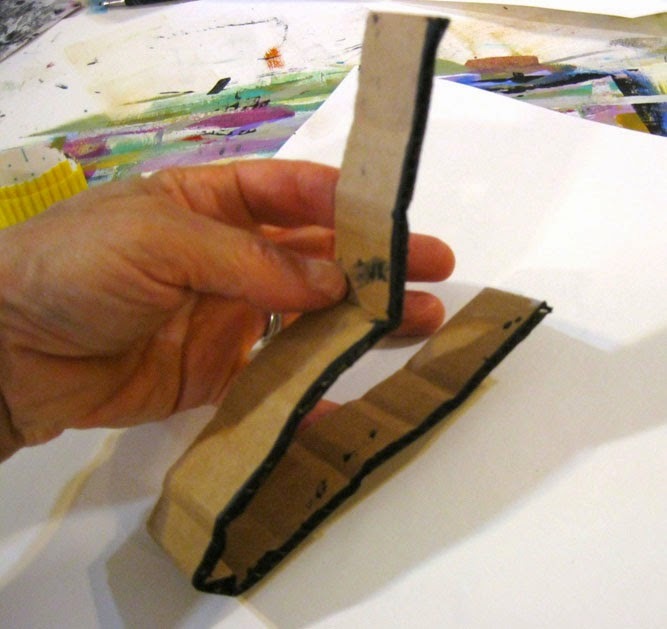 I have found your blog by chance, love the different marks you have made using cardboard. Something else for me to try in my next printing session. Thank you! Traci's book is on my want list. I would love love love to win this. I've looked at it for awhile now and I'm so fascinated by it. Such beautiful work can be made with it. Love them! I have Trauci's first book and it is great! I can't wait to try using the corrugated cardboard. Thanks for the chance to win this package, I could have a lot of fun with it. Inspiring as always. 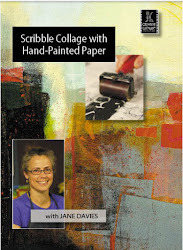 Looks like Tracy's book would be fantastic for Gelli prints, my current obsession!! Love the effect of the corrugated cardboard. Your blog is always an inspiration. Great ideas and wonderful giveaway! Eee gads! I would love to win all of these goodies. I'm not familiar with Traci's work but her book looks wonderful. Thank you for the give away. Karen Kay from Kansas City (my that's a lot of K's). What a useful and simple technique. Traci does nice work! Just fantastic. Recycle, Reuse, do art!!! Thanks for sharing...and for the giveaway. I would love to win Traci's book. Can't wait to try the corrugated cardboard stamping. Very clever and simple technique (Corrugated cardboard stamping)....have read about the Strathmore Printmaking paper and would love to try it! Fearless art, that's what I aspire to, & it takes a lot of work to overcome all obstacles in the way. Your work inspires me (I have your books "collage with color" & "collage journeys"). I love cardboard in all its many uses and I LOVE this idea! Thanks! I like how you varied the kind of marks with the cardboard. Cheers! Wonderful giveaway! Love the ideas! 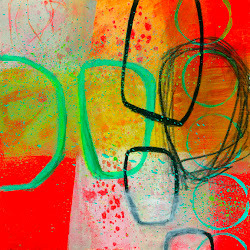 I've followed Traci a long time and enjoy her vibrant style - and creative? She's that in spades - I love that such a simple product, something we all have around the house, can be such a cool mark making tool! I've used cardboard of course in all sorts of ways - why did I never think of turning it on its side???? Genius. Thanks for sharing and I've got my fingers crossed! I would love to win and try out the techniques! It looks so fun!! I could need some kick start to get me up on the road. Since my dropout from your class I need a starter! What a fantastic give-away! I love the top one with the strong black lines and would have to try that as my head can't wrap itself around making those type of lines with corrugated cardboard in straight lines? Anyway, count me in for the drawing. Love the corrugated cardboard marks. I've never thought of using it that way! Thanks for the tip and the inspiring way you used the cardboard. What a surprising effect. I've got itchy fingers just by looking at it. And thanks for the opportunity to enter the give away. Greetings from the heart! Thanks for sharing this idea. Simple tool, great results. I enjoy seeing new ways to use "found" materials in art. Thanks for hosting the giveaway. Carole Carlson - I thought my full name would show! Now I REALLY want to read that book! Thanks for the giveaway! 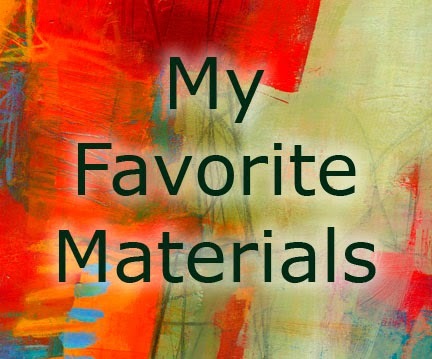 Great ideas for printing materials! Thanks! What a fantastic giveaway ! I'm so curious about Traci's new book. I love experimenting with mixed media and all kind of materials. This book looks so exciting, I am jumping up and down! Thanks for sharing it with us! Great effects! I have a piece of rolled up cardboard that I've been saving to stamp with, but haven't used it yet. This will spur me on. Thanks! I am. Off to my studio to find some cardboard! This book looks amazing.....ok so who threw out all that cardboard? 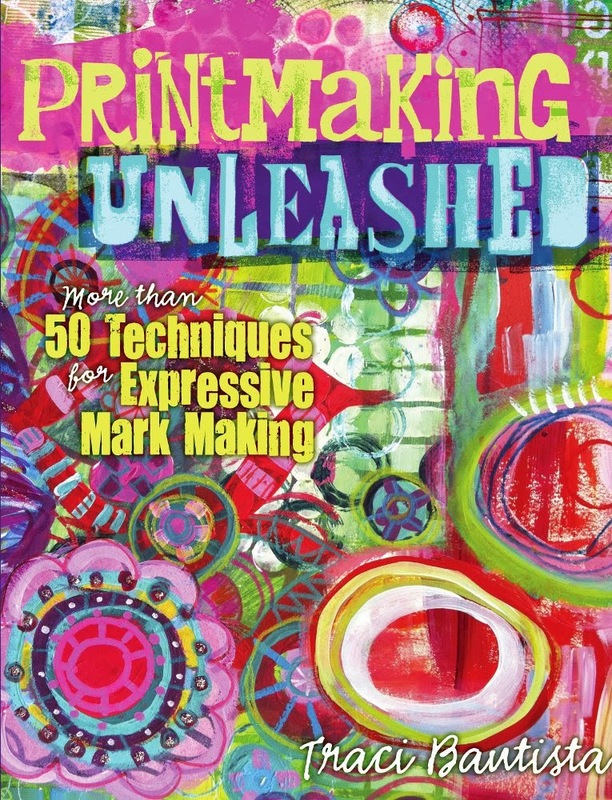 I would love to have a class just on mark-making -- guess this is the book for it -- I love it! This looks like a great book. Would love to win it. Good luck to everyone. I love new ideas for making marks and texture. The rolled cardboard looks like something I'll have to try! Dayna in Oregon (dayna@alleyartstudio.com). Thanks for sharing this post and photos of your beautiful art. I so love everything you do and really learn from and feel inspired by your videos. wow oh wow. 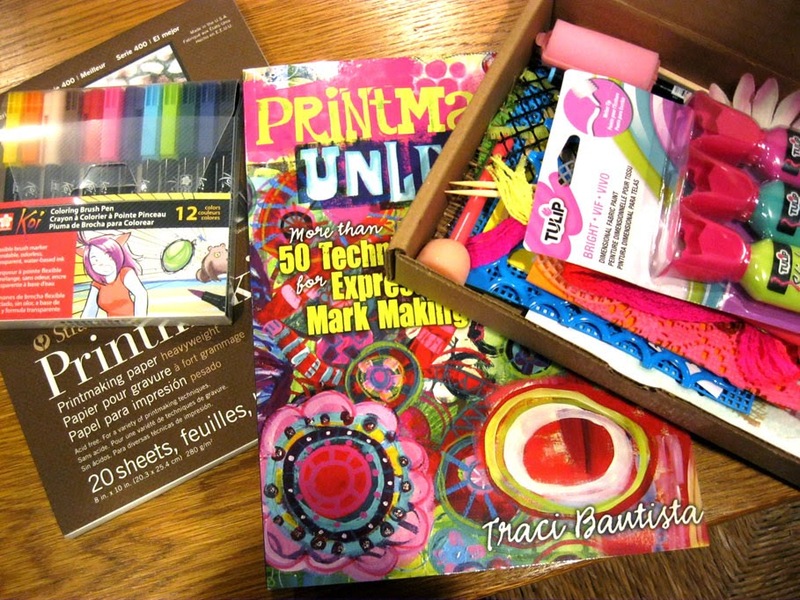 WHAT A WONDERFUL giveaway, thanks to Tracy.Cant wait to try this idea. Great ideas, Jane! Would love to win! Thanks! Looks like fun. I'd love to have a play with those ideas. I love Traci Bautista and her designs. I have been using her in my HS art classes for a couple of years and her website to inspire them with collage and layering ideas. Yippee to have published version. thank you for sharing this. Lordy, look at all these comments. I wont have a chance but will pitch my hat in anyway. Such a clever girl that Tracy is!! 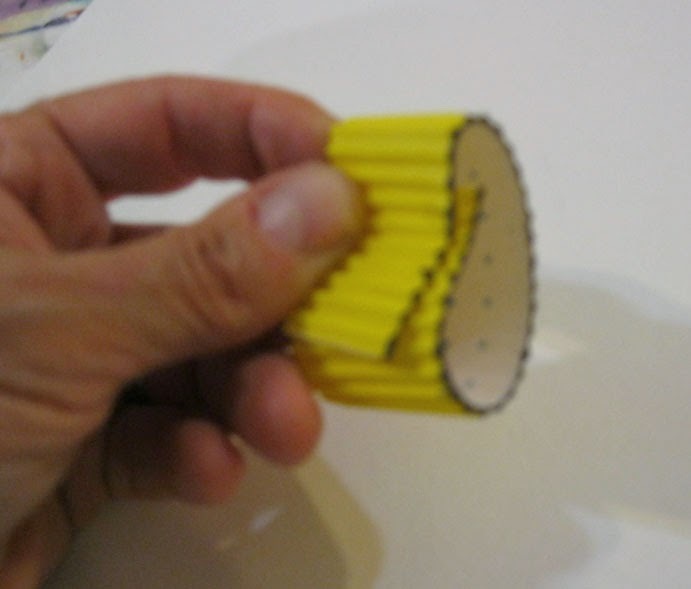 Those marks made using the strip of corrugated card and the way it undulates with that winding action are yummy. Must remember to give that a try. I love the marks you have made on your painting with these techniques. I must give it a try! Can't wait to dive into all the fun techniques that Traci shares in her new book. Wow! Look at all the comments! Jane, I live in New Zealand and already have a copy of Printmaking Unleashed so Im leaving this comment on behalf of the art teacher at school nearest to you. Great giveaway! (hope this isn't posting more than once! having a hard time trying to get the comment to show up!) I love the cardboard patterns. I've used it before, but not in this way. Thanks for the great tip! Too much fun!!!! Love it. Traci's books are all inspiring. Her printmaking tips are great, I am sure. What a wonderful giveaway! Thanks for the chance to win. I love using cardboard to make marks in my art. It is so amazing how resourceful one can be in finding new 'tools' during a workshop. What great serendipity! I would love to win the package! Thanks for the opportunity. Wonderful technique with the cardboard edge marking. Traci does great work, I had a class with her a few years back, so, would enjoy the book. Count me in! Wow, I would love to win this give away. Another reason to recycle cardboard. I love techniques that use everyday items. Thank you Jane and Traci! First I have to say how much I love what you did with these techniques in your art. Love your posts. Then how much I love Traci's techniques. I have signed up for her class. Thanks for your wonderful posts. This book sounds like it's chock full of fun ideas. Would love to play around with some of her suggestions! Thanks for telling us about it. Wow! I would love to win this and start the printmaking!!! Thanks for offering this prize package! Love the idea of using what you have at hand - so obvious but I never think of it! Thanks for sharing your videos. They have reall inspired me, especially your tissue techniques. Matt medium is wonderful! Those fractured design using corrugated cardboard are awesome ... 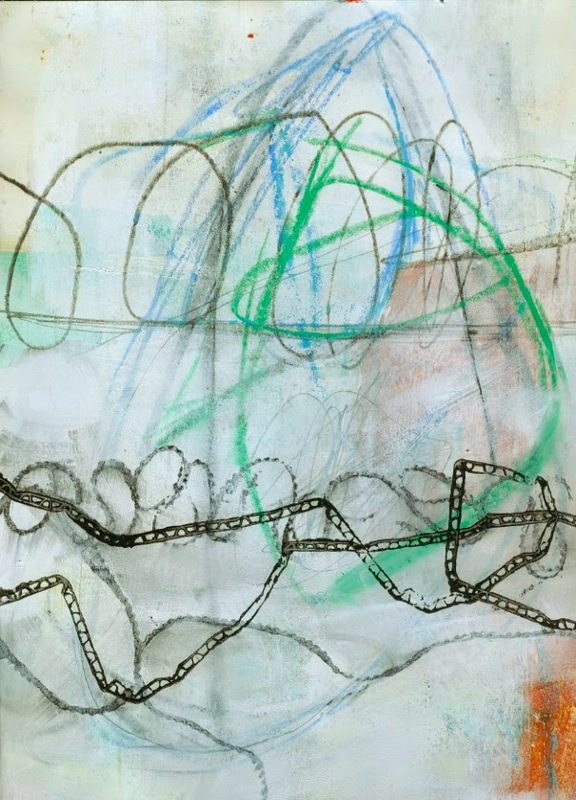 Some really good inspiration on mark making and printmaking .. Thank you so much for all the inspiring ideas you share with us !! Love these techniques!!! I would love a chance to win all the goodies! I love the corrugated cardboard technique, it's great , I must try it for sure. Thank you for the inspiration and for the giveaway. Thanks for these techniques, I'd love to have this book, I'll probably order it soon. This looks so interesting. I'm always on the lookout for new marking ideas and often the simplest things give excellent results. Going to try this! Thanks for this give away. I've never looked at corrugated cardboard this way. I'm certainly gonna try this. Karin aka kweenie2010. I love how playful the process is. What fun! You are always looking for new techniques to try--and the simple ones are most exciting! Betty Franks Krause...Sammamish, WA...MysticTulipART@gmail.com. Thank youi! 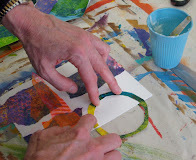 I am really enjoying your teaching and art-making style...thanks for sharing all you do Jane. Wonderful Book! it's on my list of books I want, need? LOL! Thank you for the sweet opportunity to win it with the rest of the goodies! How exciting! Looks like a fabulous book! Loved what you created from it. But then i love all your work! Thanks for the chance to win. Book looks very interesting! Sue Clover. can't find the first post,and don't want to miss this chance ! Your use of the cardboard is very elegant. The cardboard ideas look like fun. 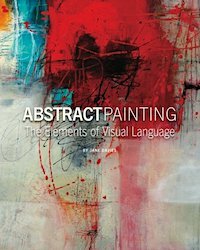 I'd love to get more art-making ideas from this book! I love the way you have incorporated Traci's technique into your art. Very inspiring. Very cool idea - wonderful work! Can't wait to try it! wonderful ideas from 2 very talented women! I am always inspired by each of you and really hope to be able to own that book someday soon. I'd very much wish to be drawn - but I think, you're not going to ship the parcel to Europe. Well, I'll take the chance anyway! Very cool! I have another of Traci's books and they are great inspiration. There are so many uses for cardboard! I love what you did with yours here. Great technique and love the way you've used it - would like to be included in the draw - thanks! Thanks for the opportunity to enter the giveaway! I love Traci's work and books. The cardboard technique is awesome. Beautiful proof that we don't need a lot of fancy tools to make art. Thanks for sharing! Oops, Randi S in Oregon! Just saw you were in Vermont. 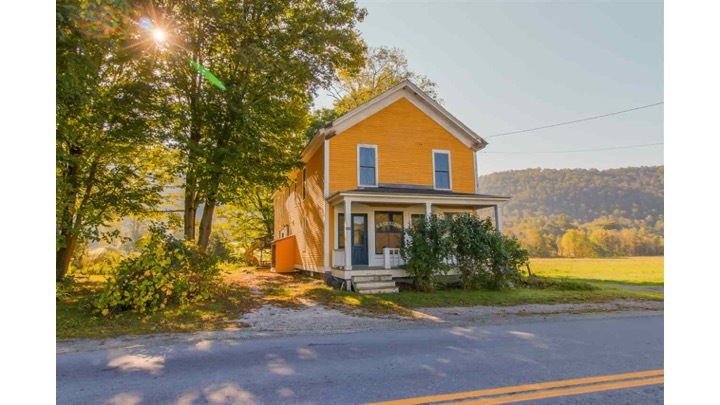 I live in Montpelier! So love all the inspiration and creativeness offered by this book and then of course what everyone takes out of it and then shares! The ideas are boundless especially when we all share! I love the colors in these pieces, and I especially love the marks made by the corrugated cardboard piece. Such fun things to try! Very nice!! and what great ideas! I wouldn't have thought to use the cardboard! Brilliant! Wow! What a generous giveaway! Full of things I'd love to have! And thank you for sharing your fantastic techniques. In the event that I should win (what a marvelous notion!) I can be contacted at lifeimitatesdoodles [at] gmail [dot] com. Hi, I love the corrugated line pattern! 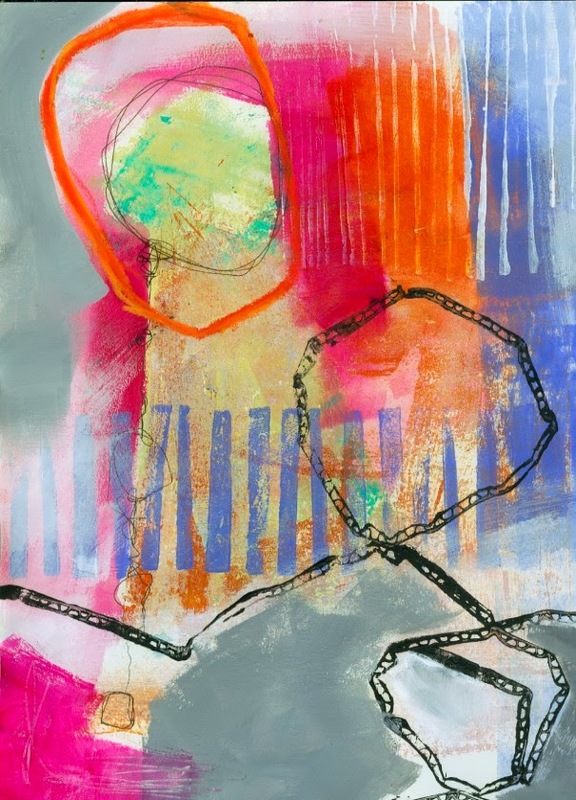 I use lots of found objects to create marks on my monoprints, empty spools of thread are fun, and drawing with sticks dipped in ink is one of my favorites. I am going to check out the new book as soon as I sign off here! Looks so much fun!!! Love mixed media! I cannot wait to dig into this book and develop lessons for my students! I need to go and dig in my cardboard stash. That is obvious. I'd love to have the book and the other goodies to play with. What a FANTASTIC idea for using up recycled cardboard! Love it! The giveaway is awesome! Please count me in!